YOGA IS PRACTICED TO UNIFY THE BODY, MIND AND BREATH. ULTIMATELY, IT IS FOR LONGEVITY: In this 10 hour workshop you'll learn the art of positioning and supporting the body for a better experience of your interior. Through a regular and smart yoga practice, we create a long and joyous life. Restorative Yoga techniques go beyond relaxing and resting. True renewal happens when the spine finds its optimal length, the joints are centered, the organs are cleansed and oxygenated, our biochemistry works at its optimum and the breath flows naturally. Yoga asana becomes a restorative practice when our consciousness can travel throughout the whole body and nurture our entire being with life force. Reni teaches techniques and prop set up to align and support the body. You’ll learn to use blocks, blankets and straps to either restore yourself at home or to work with your students. The techniques mostly stem from Katonah Yoga® and are designed to work with all types of students. This workshop is a hands-on training: besides practicing and experiencing different asana and exercises, you’ll learn how to support other people’s bodies. The goal is to develop vision and the skills to confidently and correctly touch and adjust the student's body. Did you already take a Restorative Workshop? Some of the content of last year's workshop will be a repetition, yes, and there will be a lot of new content added too! Reni's material always evolves further, and she guarantees you a new and rich learning opportunity. Feel free to come again! In order to understand and better integrate the practice, the prop set ups, the adjustments and the theory of Katonah Yoga it is helpful to train in different opportunities and over a longer time. The 10 training hours can be accredited as Continuing Education at Yoga Alliance (YACEP) and banked towards a Katonah Yoga® certification. 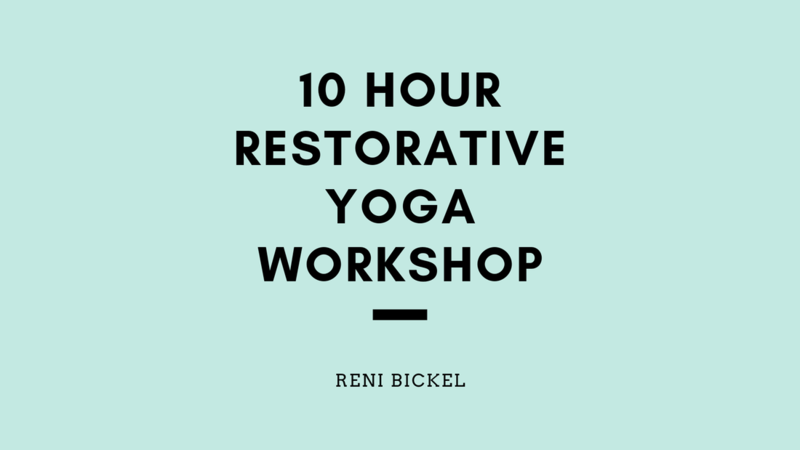 The workshop is organized and facilitated by Reni Bickel. To sign up or ask further questions, please press button below. *Please be aware that the participant number for this course is limited to a certain amount. Complete reservation is requiered.